HMD Global has launched the new Nokia 2.1, 3.1 and 5.1 at an event in Russia. The Nokia 2.1 and 3.1 are Android One-based targeting the entry-level smartphone market. Of these, HMD says that its 3 series has been its most popular franchise globally. The new Nokia 5.1 is the more upmarket model, but is still competitively priced and offers features found in more expensive mid-range models. The Nokia 2.1 offers 2-day battery life thanks to a large 4,000mAh battery and comes with a new 5.5-inch display that is 20 percent larger than the original. It incorporates dual-front facing speakers and is powered by a Qualcomm Snapdragon 425 quad-core SoC. The Nokia 3.1 is a mix of polycarbonate and CNC'd alumimum sides. It's 5.2-inch 18:9 display is targeted at those who prefer more compact devices that can be operated one-handed. It is powered by a MediaTek 6750 octa-core and features an upgraded 13MP camera with auto focus. It will come in 2GB/16GB and 4GB/32GB variants. 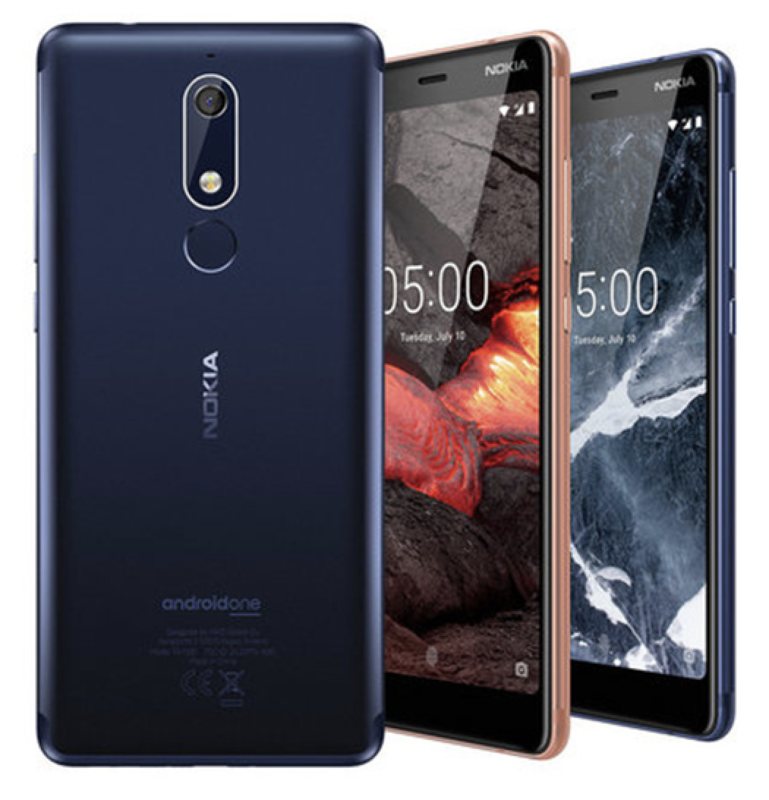 The new Nokia 5.1 is machined from a single block of 6000 series aluminum that is 2mm narrower than previously, but integrates a 0.3-inch larger 5.5-inch 18:9 1080p display. Its new 2.0GHz MediaTek P18 octa-core processor that is 40 percent faster. Its fingerprint sensor has been moved from the front to the rear of the device while its camera has been upgraded with a 16MP sensor incorporating phase detection auto focus. It also supports Google Pay via NFC. It will be available in 2GB/16GB and 3GB/32GB variants. The Nokia 2.1 will be available in July for a global average retail price of US$115 while the Nokia 3.1 will be available this June for a global average retail price of US$161. The Nokia 5.1 will be available from July for a global average selling price of US$220. Each device ships with Android Oreo, but is ready for Android P.
Together with Nokia 8 Sirocco, Nokia 7 plus and Nokia 6.1, Nokia 5.1 and Nokia 3.1 also join the Android One family, delivering an experience designed by Google that is smart, secure and simply amazing. Nokia smartphones with Android One offer more storage and battery life out of the box, as well as the latest AI-powered innovations from Google to help you stay ahead of the game every day. Nokia 5.1 and Nokia 3.1 will receive three years of monthly security patches and two years of OS updates, as guaranteed in the Android One programme. This puts them among the most secure phones out there, always up to date with the latest Google services like the Google Assistant and Google Photos with free unlimited high-quality photo storage. Meanwhile, Nokia 2.1 comes with Android Oreo™ (Go edition), designed for smartphones with 1GB RAM or less, giving you a smooth Android experience, more storage out of the box and consuming less data. All three phones are ready for Android P.